Deeside Agri Services hold direct accounts with all the major agrichemical manufacturers, allowing us to give impartial advice. Our agronomists are specialists in growing wheat, barley, oats, potatoes, beans, maize and veg crops. We also offer advice and products for use in grassland. The three most important elements to maximising our grass output in Ireland are; PH and lime, P and K, weed control. Each part is as important as the other. Seeds from weed plants are resilient and can be dormant in the soil for many years. Docks, thistles, nettles, dandelions, buttercups and chickweed can restrict grass production and compete for important nutrients within the soil. Trials show the every 1% of weed infestation will decrease you grass yield by 1%. So take a 10 acre field with a 10% infestation of docks you Can lose up to 10 ton of grass from that field, to put a monetary value on this it would be equal to €20 to €25 per acre. In Ireland the average farm produces 7/8 ton of DM/HA, the top farms are producing 12 ton of DM/HA, a difference of 33%. We at Deeside can offer the farmer advice and product selection, timing and what will suit their current farming systems. Applying the correct herbicides can offer the farmer value for money .Best time for applying herbicides is when weeds are actively growing and healthy and at the optimum growth stage. This is very important to receiving the best results. Short term control products for docks/nettles would include, Hurler, Hi-load mircam or relay. Long term control products for docks/nettles/thistle would include Forefront, Doxstar or Pastor. 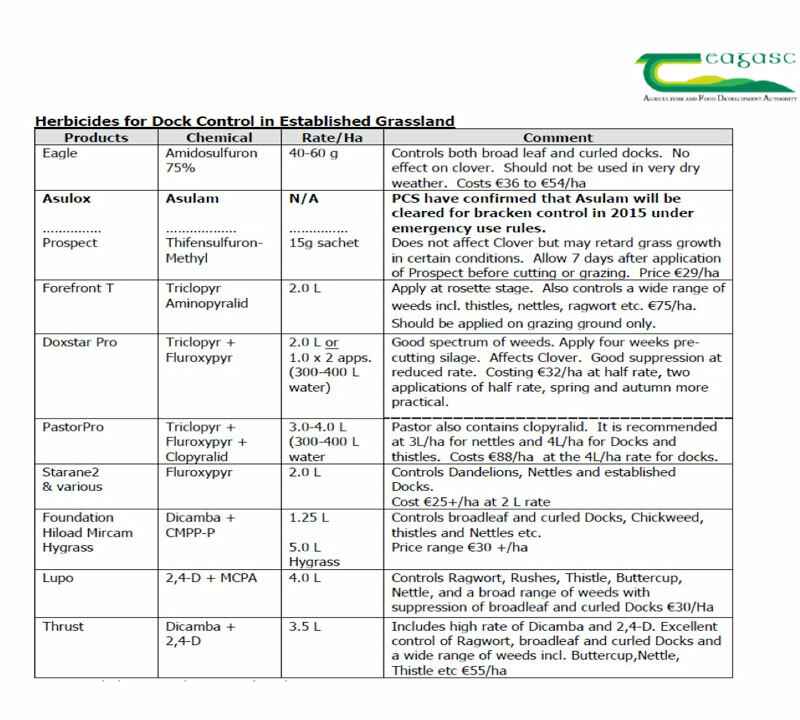 Products such as d50 or Lupo can give good control of ragwort during October to march period. New lays or clover safe products such as legumex or eagle can give good control at early timing. See table below for more details of products. We at Deeside pride ourselves at providing specialist advise on grassland and crop management and offering the farmer the most suitable options for increasing his/her profits on their farming enterprises.